At Monty Formal Wear, Prom is one of our busiest times of the year. Our goal is to provide our customers with the best selection of prom tuxedos for rent in Windsor and Essex County, and to make their experience when shopping for that perfect prom tux a truly outstanding one. For over forty-five years we have been offering one of Windsor’s best selections of prom tuxedos, and want to bring that experience to helping make prom a great experience for you. We are proud to carry one of the largest selections of prom tuxedos in Windsor and Essex County, including a full range of styles, sizes, and colours to fit you and get you the look you want. 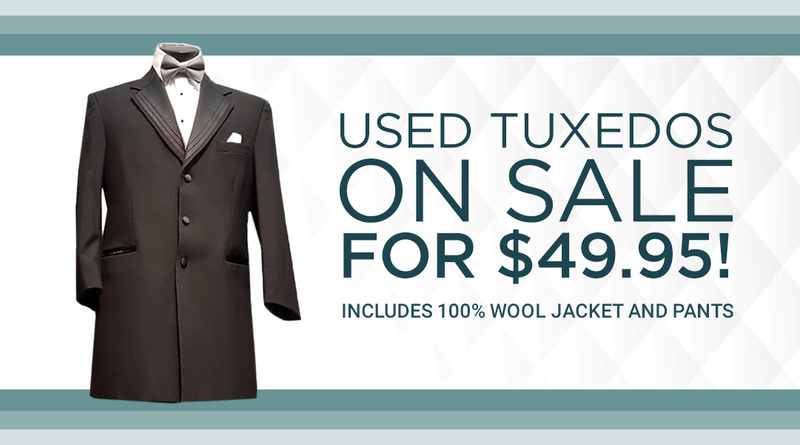 With tuxedos in stock from many top designers. Including Christian Dior, Oscar de la Renta, After Six, Michael Kors, and more, we can offer you a number of great choices to get the right prom tux for you. With choosing your prom tuxedo, you also need to make sure to get the right fit. At Monty Formal Wear, we not only have an outstanding selection of prom tuxedos in stock, but we can also take care of any alterations right in our store to make sure that you can get a proper fit each and every time. 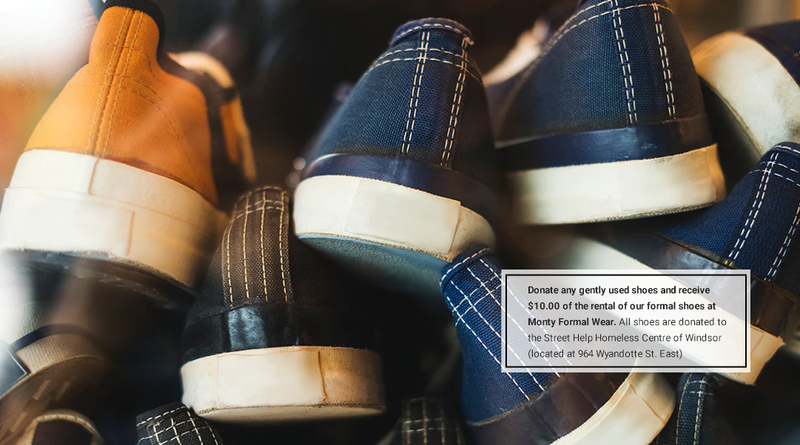 You don’t have to worry about being limited to just the fits that already in stock at Monty - instead, you can get one that’s customized to you. Getting the right tuxedo and the right fit is great, and becomes even better when you can rent or buy the right accessories to go with it. From shoes to ties, shirts, and more, we have one of the best lineups of tuxedo accessories in Windsor that you can find. Our expert staff will help you to match the right tux with the right accessories to create a more complete look, helping you to truly stand out on your prom night. Like with our tuxedos, we will work to customize your look and fit to what’s best for you. For some people, buying their tuxedo and all of their accessories for prom night is the right decision, but for many of our customers, we recommend a prom tuxedo rental instead. Our prom specials let you get a great look at an affordable price, and make sure that you don’t have to buy a tuxedo that you might not use again just to have it for one night. We always recommend that our customers rent their prom tuxedo and accessories early for the best selection. With the number of people looking for a prom tux during this time of year, even with our extensive selection, renting early lets you have your choice of our complete stock of tuxedos for rent. Getting your prom outfit selected early also gives you time to put together the right look, and get any alterations taken care of well in advance to make sure all of the details are perfect for your big night. Let us be a part of making your prom perfect. For the right look at the right price for your prom, let our professionals get you the right tuxedo with the right accessories. For more information on how we can help you look your best for prom night, contact us or visit our store today. 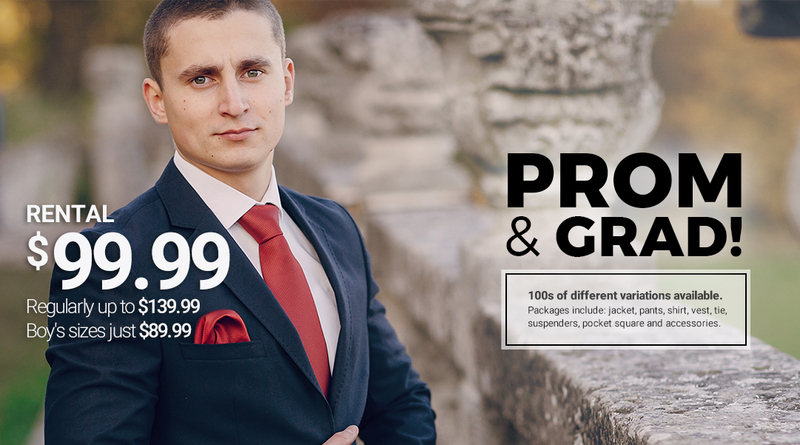 We look forward to being your first choice for all of your needs for formal wear in Windsor and Essex County now and down the road.